Crispy, chewy, and breaded with tartness and spiciness. Pair that with a creamy cool vegan cucumber ranch and I guarantee you won’t be able to stop until the entire plate is gone. Cut the cauliflower into medium sized florets. Wash and set aside to drain out the water. In a bowl, combine non-dairy milk (soy milk), flour, and 2 teasp garlic powder, and some freshly ground pepper. Whisk and set aside. In another bowl, add the breadcrumbs. One at a time, take each individual cauliflower floret, dip it in the milk/flour mixture to coat completely (allow any excess to drip off), then place in the breadcrumb bowl. Using your other clean hand, roll the cauliflower in the breadcrumbs until completely coated on all sides. Place on the parchment lined baking sheet and repeat with the remaining cauliflower florets. (note, by using one hand for the wet coating, and the other hand for the breadcrumbs, it minimizes the clumping in the breadcrumbs bowl). 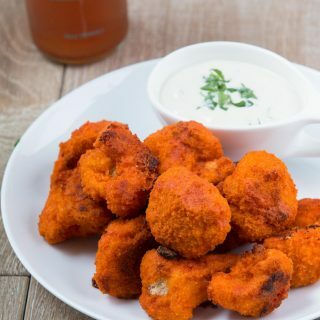 Once all the cauliflower florets are coated with the liquid mixture and breadcrumbs, place in the oven and bake for 15-18 minutes until crispy and slightly golden brown on the outside. In the meantime, make the sauce. Heat a sauce pan on low-medium heat. Whisk all the sauce ingredients above just until the butter is completely melted and the ingredients are combined. Turn the heat off and set aside. Once the cauliflower is crispy and slightly golden, remove from the heat and toss a few at a time to completely coat in the sauce and place it back onto the same parchment paper. If there is extra sauce remaining, drizzle it over the cauliflower with a spoon. Place the cauliflower back in the oven for about 5-8 minutes. Remove from the oven and serve with Vegan Cucumber Ranch! Store any leftovers in an airtight container in the fridge and re-heat at 375 degrees the following day! Sauce - I used and highly recommend using Cholula hot sauce when making the buffalo sauce because of its flavor profile. I have tested this recipe using Cholula. But if you use a different hot sauce, be sure it's one that's smooth and bold in flavor. You may need to adjust the flavor a little but should work fine with most (note: if you use a hot sauce like Tapatio, this sauce will not taste good). For the gluten-free option, I used white rice flour. Non-Dairy Milk - I typically use soy milk for this recipe, which makes for a very thick coating. If you prefer a thinner coating or find the thick coating difficult to work with, either add a tiny bit more soy milk into the coating mixture or use another thinner non-dairy milk such as cashew milk.